In my family, tofu pot pie is comfort food. This recipe is a great way to pack a bunch of veggies into your child, and it is perfect in all seasons. In the winter, we enjoy its warming qualities, and in the summer we pack it full of garden veggies. If you make a crust with oil, this recipe is vegan, but I prefer a flaky buttery crust. Be creative with your own pot pies and mix together the veggies you have in the refrigerator. Every pot pie comes out differently, but they are always delicious, especially when using organic ingredients. Knead until the dough holds together (you may need to add a little extra water), but do not overwork it. The warmth from your hands will soften the butter, and you will lose the flakiness of your crust. Divide the dough into two balls and chill for 30 minutes in the refrigerator or 10 minutes in the freezer. Roll out a top and bottom crust. Time for the veggies and tofu! Combine veggies, tofu, and gravy in a large bowl. Lay out the bottom crust in a deep pie plate, and then add the veggie filling mixture. Place the top crust on, and poke the center with a fork. Bake at 375 for 40 minutes. This recipe is a combination of pot pie recipes found in the Horn of the Moon and the New Farm Vegetarian cookbooks. I’m not a big fan of tofu, but this recipe sounds good. My wife is somewhat of a “health coach” and she loves to use Bragg’s Liquid aminos, so she’ll be interested in this, too. I’ll check out some of your other recipes as well. Tony, You can make the pot pie without tofu, and it is still delicious. I do that sometimes when we are out. I love my Farm Vegetarian Cookbook, and especially the tofu pot pie, but I admit I have never tried variations on the ingredients. Looking forward to it for summer meals from our veggie patch. Can this Tofu Vegetarian Pot Pie be made in individual, single-service pots with the same recipe? 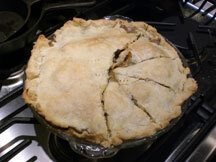 Thank you and looking for more vegetarian recipes for pot pies – we are a family of four ovo-lacto vegetarians. I have never tried making it as an individual pie, but I don’t see why not. I would assume the cooking time would be less. It’s a great idea to put tofu into the veggie pie as well. Good way to get more protien.